Von Willebrand Disease: The 4 minute overview [with images] | George King Bio-Medical, Inc.George King Bio-Medical, Inc. The first written piece describing this inherited bleeding disorder was published by a Finnish physician, Erik von Willebrand, in 1926. His studies began with an assessment of a family living on the island of Foglo in the Aland archipelago in the Baltic Sea. Eventually, the father and all four members of his family passed away as a result of the bleeding disorder. In this initial study, Dr. Willebrand noted that the patients had a prolonged bleeding time despite having a normal platelet count, and exhibited an autosomal dominant mode of transmission of the bleeding problem. After this discovery the disorder was named after its discoverer, Dr. Willebrand. During the 1950s and early 1960s, it was realized that this condition was also typically associated with a reduced level of factor VIII (FVIII) activity, and that this deficiency could be replaced through the infusion of plasma or plasma fractions. In 1971 a significant advancement was made by two groups of investigators who showed, for the first time using immunologic assays, that FVIII and von Willebrand factor were distinct proteins. Content Credit: Lillicrap, David, and Paula James. Genetics – male or female? Image Credit: “HoG Handbook.” Hemophilia of Georgia. Type 3 WVD is found in 5%-10% of patients. See George King Bio-Medical von Willebrand products here. Note: We offer VWD plasmas for all three types. Assay sheets available upon request. “Von Willebrand Disease.” National Hemophilia Foundation. N.p., 04 Mar. 2014. Web. 06 May 2016. Lillicrap, David, and Paula James. “Von Willebrand Disease: An Introduction for Primary Care Physician.” Treatment of Hemophilia 47 (2009): 1-7. Print. 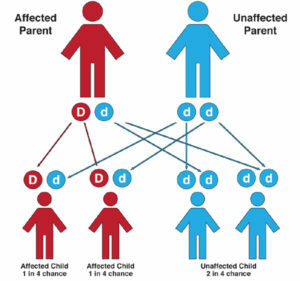 “HoG Handbook.” The Inheritance of Von Willebrand Disease Genetics Hemophilia of Georgia. Hemophilia of Georgia, n.d. Web. 09 May 2016.